GRAIN fights for a better global food system, based on biodiversity, agro-ecology and short circuits, and under control of local communities: a food system good for people and for the planet. It fights against the corporate-controlled industrial food systems, which destroy the environment and local communities. GRAIN began in the early 1990s, challenging the dramatic loss of seed diversity on farms. 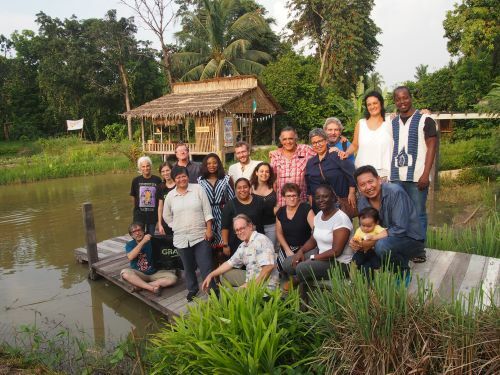 That work soon expanded into a larger programme including struggles for land, seeds, agroecology and climate in active collaboration with others. GRAIN now works in support of small farmers and social movements for community-controlled and biodiversity-based food systems. This takes the form of independent research and analysis, networking at local, regional and international levels, and fostering new forms of cooperation and alliance-building. Most of its work is oriented towards, and carried out in, Africa, Asia and Latin America, and it works directly with grass-roots partners in those regions. It has played a role in creating better understanding of issues such as land-grabbing, control over seed and the role of industrial food in the climate crisis. © 2019 Lush Spring Prize. Todos os direitos reservados. Foto principal: Lottie Cunningham, do Center for Justice and Human Rights in the Atlantic Coast of Nicaragua (CEJUDHCAN), e Simon Mitambo, da African Biodiversity Network, dirigem o debate "Fortalecendo o Conhecimento Indígena" na convergência do LUSH Spring Prize de 2018. Photo by Allessandro Robolino.